As spring approaches, your Spring HVAC maintenance should be one of the first things on your to-do list. HVAC systems are important elements meant to cool and heat up both residential and commercial buildings. These systems are used at times to purify contaminated air, such as bad odors, chemical, unwanted compounds and other unwanted elements in the air. Refrigerated air units create a comfortable living space in any building when they are properly installed and maintained. The indoor unit contains a supply fan, cooling coil, and an expansion device. It handles air flow throughout the building. The condensing unit houses the compressor and the condenser coil. These systems are often found in homes and small commercial buildings. They have one of the highest energy efficiency ratings of all types of refrigerated air units. Another form of heating must be used with a split-system such as electric heating. A cooling only packaged-system has all components of the split system but in one casing. It is placed on the outside of the building. Air is sent to the system through air ducts and then sent back as cool air by a distribution system. They also require a separate heating method just like the split-system. The other variety of HVAC system is the heat pump. This type is similar to the cooling only systems but this one has the ability to reverse the cycle. They only cool and heat the living space and mostly are used indoors. At times, these systems require electric heaters so as to work at lower temperatures. They require some time before they can defrost and get functional. The heater is used to heat up the building while the pump is used to defrost. When purchased, they come as a combined unit of split and packaged unit. Chilled water systems are another variety of refrigerated air units used in commercial and residential units. Water is pumped all through the system around the building. The cool water then cools the air around it. The system is made in such a manner that it has the ability to transform the cold water into cold air. The most commonly used type of air conditioners is the split or package cooling only units. These are fairly easy to install and do not require special equipment or facilities to run. With the proper maintenance, cooling only systems remain efficient and effective for many years. 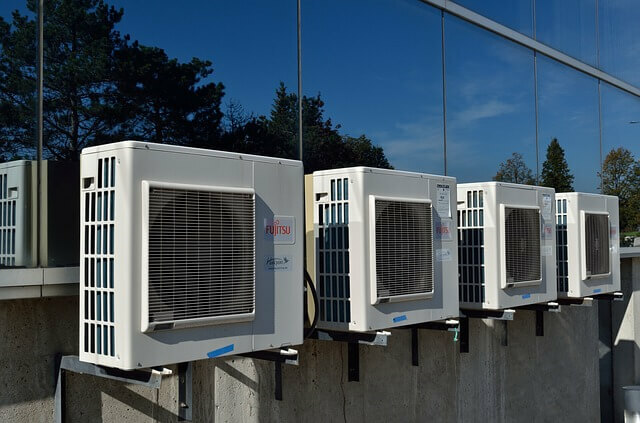 Contact an HVAC service to determine the type and size of refrigerated air units that will work best for your business facilities. They will be able to provide you with estimates on the needs and general installation costs. Once the system is installed, be sure to have them perform maintenance on it every year to ensure the air unit has a long and productive life.